• Online Chat Assistance Allow web site visitors to chat with your website customer care agents in real-time. 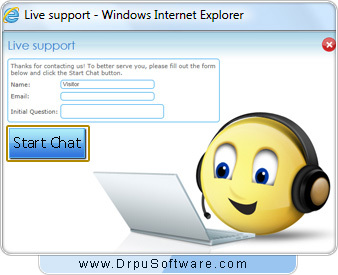 • Operator To Operator Chat Support Provision of Operator to Operator chat is provided for more user flexibility. • Operator Online/Offline Notification Visual interface of software indicates change in state if agents are online or offline to accept chats. • Chat Transfer If an operator is faced with a customer query and he/she knows that it is better suited to another operator, the chat can be transferred easily to another operator. • Handling Multiple Customers At a Same Time Single operator can assist multiple website customers at a same time. • Monitoring Website Visitors In Real Time Helpful in tracking Who, What and Where of Website visitors in real time. • Visitor Typing Indication Operator can easily view when visitor is typing before sending the message. Thus helps to facilitates smooth conversation. • Push URl’s An operator has facility of sending pre-defined URL of the websites to assist website visitors. • View Chat History Provides chat history details along with the chat date, time, visitor’s detailed information and full text. • Email Transcripts Of Live Chat Sessions Facilitates to send the details of live chat sessions to the visitor at desired email id. • Canned Messages Support Canned messages are saved messages used when operator needs to response visitor immediately. • Tracking Visitor Information Displays detailed information of Visitor including Visitor IP, Visitor Name, Arrival Time and Date, Browser, Department and Current Page. • Chat Backup and Restore Facility Facilitates to backup and restore chat conversation at user defined safe location. • Block Selected IP Address Facilitates to Block IP if required by the operator to prevent chat from selected IP Address in future. • Browser Tab Browser Tab is provided for online searches for website operators. • Sound Settings Operator can select and play sound file for any Audio Notification if visitor arrives for chat.